and other loud undefined noises? Miles always runs and tries to hide under the bed although he can’t quite get his full body underneath the bed during the thunderstorms. He is a German Shepherd but thinks he is a puppy! Allegro Paws: Classical Music for Pets™, "Leisure Time" was created for your favorite family member to enjoy a cozy and comfortable environment either during thunderstorms or firecrackers or with an active household. The evening time is the perfect time to play "Leisure Time" for your pet to help him relax from a busy day with the family or from a day of unusual or stressful distractions. Does your pet bark incessantly at his pet friends? He may be experiencing territorial aggression. Our albums help induce a calming environment for all of his friends including your pet. Are you a pet grooming specialist and notice the hairs of your customer rising along his spine? Help soothe his nerves so that he is a happy customer and you are a happy groomer! Let us help you with our harmonies of Allegro Paws: Classical Music for Pets™ albums. Do you own a doggy day care center or a boarding facility and experience some hostility by your guests? Allow our music therapy to perform its magic and help bring joy during their stay with our fun melodies and expressive phrases. They will become your favorite guests! Several studies have proven that specific tonalities, textures and temperaments commonly found in selected pieces from the classical genre, can have a soothing effect on our furry friends. Does your pet sleep peacefully or is his nervous energy preventing restful sleep? Our music helps to slow the heart rate so that pets can peacefully fall asleep in the midst of other minor distractions. Allegro Paws: Classical Music for Pets™, "Naptime" will lull your furry friend to sleep. As well, your puppy may need a little sprinkle of Mozart or Bach to help ease him into the long voyage of night sleep. I still remember some of the rougher nights with Miles when he was a puppy. Is it time for a little down time for yourself but your pet may still want to play? Its okay! We can help you get to your next activity on your to-do list and still give your pet comfort. Our "Naptime" album will help bring your pet to a more relaxed mood and will allow you to do your activities with assurance that your pet feels loved. Did your pet experience separation from a loved one, or experience a loss from a sister or brother pet? Allow our music to hug your pets as they process their loss. We are a music therapy program designed to help bring joy back into your pet's life. Does your pet hold his head down, or tuck his tail under his hind legs? He may be experiencing feelings of anxiety or fear. Our albums, Allegro Paws, serve as a music therapy tool. Let our albums help relax your pet with our carefully chosen selections of music to help boost his confidence. Is your pet advancing in age and experiencing some minor aches and pains? Just like us, they feel a little slower and they may have lost a little confidence in their bodies' performance. Let us help you bring joy to your pet's day. Our music will sing to his soul. Try Allegro Paws: Classical Music for Pets™ albums. Do you have a handful of furry four-legged guests in your doggy day care center? My dog, Miles, experienced an extended stay at a doggy day care some years back. Miles is one of the most polite dogs I had ever known. One example of his courtesy was at our apartment elevator. He was always very careful when preparing to enter the elevator. If there was someone else waiting, he waited for them to enter the elevator first before he would walk into the elevator. However, on this day leaving the doggy day care, I was made aware of his displeasure as soon as we left the building. As he exited the building, he aggressively pulled me to the side of the building just in front of the door. Before I knew it, he left a gift that would state his preference to never return to that facility. I later inquired to what music they may have played for their guests. They admitted to having played whatever was on the radio stations. Allegro Paws: Classical Music for Pets ™ albums provide hours of therapeutic music to increase the pleasure and comfort of your furry four-legged guests while on their vacation. Kennel life and doggy day care environments can be challenging for pets. Offering the programs performed on Allegro Paws: Classical Music for Pets™, can offer a more soothing environment for your guests. The temperament induced by the spirit of the music allows for a more comforting and relaxed environment. Starting with the upbeat peppy and cheerful Allegro Paws: Classical Music for Pets™, "Left Home Alone" album, followed by "Leisure Time" and "Naptime", your guests will look forward to their return visit when mommy or daddy bring them back to play with their friends. Allegro Paws music therapy program offers comfort for your pet at home, doggy daycare centers, boarding facilities, grooming facilities, veterinary hospitals, and doggie hotels. 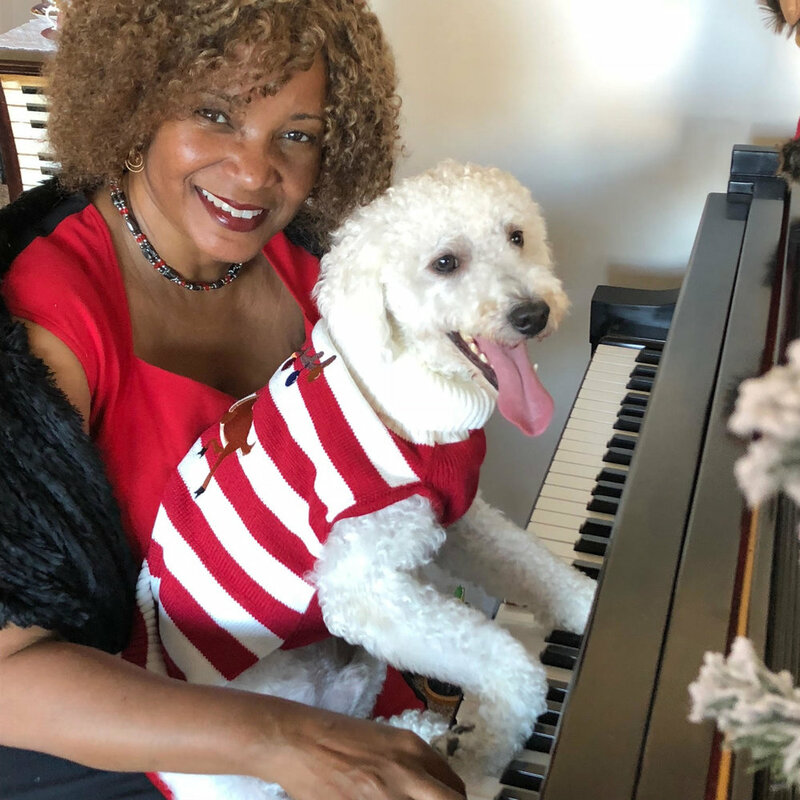 Dr. Karen Walwyn interviews Dr. Leslie Sinn, DACVB, Veterinary Specialist in Behavior on the subject of why not just turn on the radio to the classical station for pet music therapy. Dr. Karen Walwyn interviews Dr. Leslie Sinn on the elements of classical music most therapeutically significant for pets. Dr. Karen Walwyn interviews Dr. Leslie Sinn on the subject of how certain classical music is therapeutic regarding the behavior of pets. Dr. Karen Walwyn interviews Dr. Leslie Sinn on the specific quality in certain classical music to which pets positively respond.